We perform engineering analysis via computational tool FEA. Hi-Tech is into providing accurate and cost-effective solutions in FEA within a given time frame. Our professionals working in FEA section are highly skilled with expertise in FEA design, simulation and structural analysis. Hi-Tech carries out static structural analysis of components and structures. The analysis determines displacements, stresses and forces present in a structure caused by any load. The analysis can be linear or non-linear in nature. It is a part of the design process that limits the need for expensive prototypes. This limits delay, re-draft and re-work. It is cost-effective and saves time and other additional developmental expenditure. Experts at Hi-Tech working under Linear Stress Analysis determine stresses and deformations in a material. The response of parts due to the effect of forces, acceleration, and temperature is also calculated. It is a complex procedure. Experts at Hi-Tech, while carrying out a Non-Linear Stress Analysis, have to take care of the time component while controlling loading and capturing reaction of an impulse load of impact. 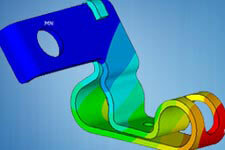 Our professionals are providing FEA dynamic analysis services to different industries. Services include field measurement and analysis services in stress, vibration and thermal analysis. FEA consultants at Hi-Tech use simulation and analyze the effects of various loads on any structure. Hi-Tech carries out Thermal Analysis for analyzing how much thermal load a component can carry. We provide services that examine the heat transfer to a system. Our clientele includes industries: marine, aerospace, automotive, defense, oil and gas and security. Fatigue analysis determines the causes of failure of a component under heavy loads applied repeatedly. Fatigue analysis makes certain selection of suitable material and no repair. Fatigue analysis experts determine and attend to the design and structural issues of components and systems, at large. Hi-Tech employees carry out Buckling Analysis when structures display critical reactions emerging from limit point and bifurcation of equilibrium. Experts at Hi-Tech, apply Buckling Analysis to components and systems to identify critical load levels.